NOW RELEASED IN BOTTLES! 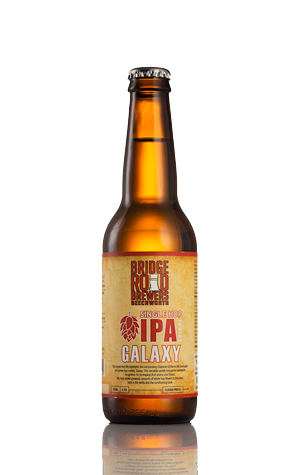 Named after the Australian hop variety that has done much to influence beer styles in Australia in recent years, the Galaxy IPA was first brewed by this Beechworth brewer last year. Using nothing but the Galaxy hop both for bittering and aromatics / flavour, the 2010 variant was unveiled for the first time on the first day of October's Microbreweries Showcase. This year there's a higher amount of dry hopping - 12kg in 800l - resulting in a lighter, less bitter beer that's all about the decorative properties of Galaxy. Fresh, floral and fruity, the nose is mixed citrus fruits, such as grapefruit, plus lemongrass, perhaps even freshly cut grass, with the flavour suitably tropical and refreshing too - just in time for the warmer weather. An IPA in name more than style, it's nevertheless another quality addition to the Bridge Road roster.